The correlation between making large donations to the Labour Party and receiving an honour is extraordinary. Statistical analysis shows that 58.54% of all donors giving more than £50,000 to the Labour Party receive an honour. This compares to just 0.035% of non-donors. Large Labour Party donors are 1,657 times more likely to receive an honour than a non-donor and 6,969 times more likely to receive a peerage. It is almost impossible to avoid the conclusion that the Labour Party has been selling honours, including places in the House of Lords. An analysis of all donations over £50,000 since 2001 reveals that Honour certainly has its price. We publish below the average amount donated by the recipients of various honours – an “Honours Price List”. Those receiving a Peerage have given £1.07 million on average, and a Knighthood £747,000… Compared to the prices Lloyd George was charging, Labour is currently charging less for peerages, but more for OBEs. In today’s money, Lloyd George charged £1.9m million for a peerage, and just £3,800 for an OBE. The Bow Group compared the prices which the Labour Party appears to be charging to those charged by Maundy Gregory, Lloyd George’s fixer, in the 1920s. They then adjusted these for inflation between 1922 and 2006. In 1922, a Peerage cost £50,000, and Knighthood £15,000. In today’s money, this works out at £1.9m for a peerage, £571,000 for a Knighthood. 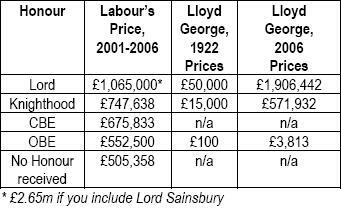 Compared to Lloyd George, Labour today charge less for a peerage.